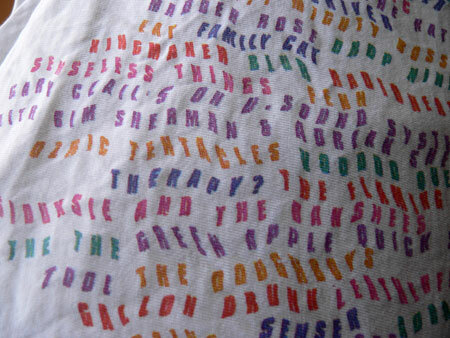 While doing my washing I noticed this t-shirt had survived yet another wash. Even though it’s obviously disintegrating I can’t bring myself to throw it away because of the memories it brings back. One day it probably will literally disintegrate, so I’ve documented it. Back in the early 1990s I spent two years living in England. One of the things I really wanted to do during this time was go to the Reading or Glastonbury festival. 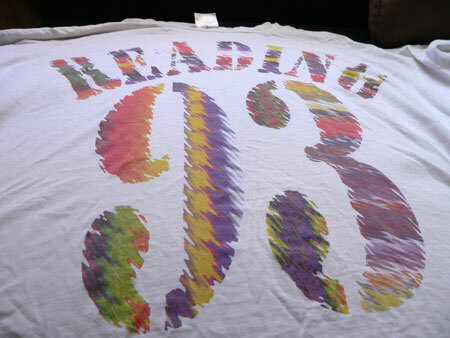 I managed to get my two flatmates to come to the Reading Festival with me in 1993 and this is the t-shirt I bought there. 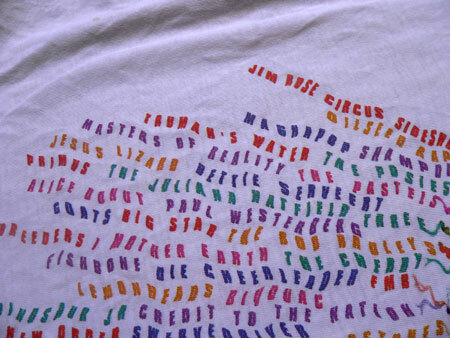 Let me turn it over and show you some of the fantastic bands that played there. We have the Big Day Out here which get some pretty good acts, but nothing like festivals in Europe attract. Can you read any of these names? Or is your eyesight exceptional enough to make all of these out? No, probably not, so here’s my attempt at listing them all (some of the names might be wrong because the font used is fairly illegible so please let me know). An asterisk next to ones I saw, or think I saw, or indeed wish I saw. It’s a pity I don’t remember more of it but sneaking of the bottle of vodka in was probably not a good idea for the memory. I did share the vodka with my two flatmates. I do remember sleeping three people in a two-man tent amongst hundreds of other tents. I do remember lying in the tent one night and someone pissed on the outside of our tent. I do remember between acts people would light up those disposable foam type containers to make little fires and the awful chemical stench they made. It really wasn’t cold enough to even warrant a fire but the smell of the chemical smoke was really awful. Despite this, the bands were awesome and I’m so glad I went. Here’s a taste of New Order’s Round and Round live at Reading Festival 93. It’s funny how those uncomfortable things we did when younger are now fondly looked back on as nostalgia. I have memories of sleeping on a beach somewhere after a live gig in Victoria. I wouldn’t do it now, but I sure look back at it fondly. Awesome lineup by the way. My picks were pretty much the ones you had asterisks beside. Good taste! Nostalgia is a funny thing. I remember travelling through India and being sick a lot of time but I look back on that time with fondness despite being ill.
We obviously both have great taste in music! You DO have great taste in music, and what wonderful memories (despite the vodka and chemical fire haze). 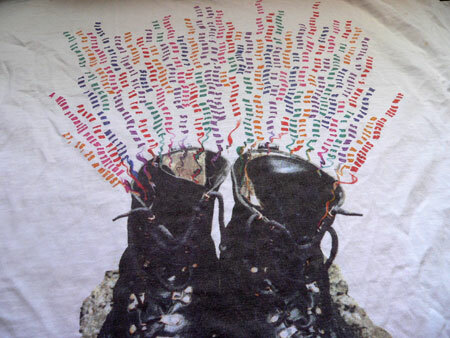 I have a few t-shirts that are threadbare but remain because of the memories they invoke, but none quite tell the story as well as that one. You should take the main bit and sew it into a quilt or wall hanging or something. 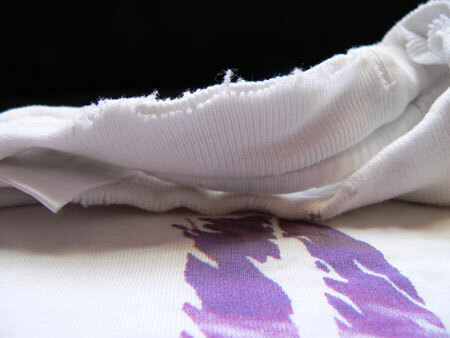 Jeanie, that is a great idea about preserving part of the t-shirt. Pity I’m not a quilt or wall hanging sewer.